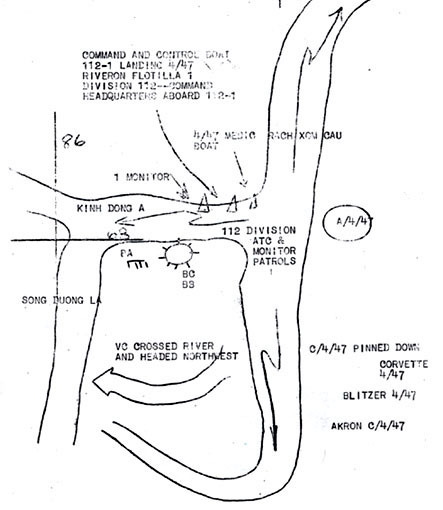 A fierce one day battle in the Mekong Delta. . . I was assigned as an M-60 Machine Gunner's assistant that fateful day and, although long ago now, it was my first taste of actual combat with real bullets fired at me. We were on a battalion size operation with the various infantry companies spread all over numerous rice paddies in the Mekong Delta on what seemed like another long hot and boring mission when all of a sudden our world tipped upside down in an instant. BOOM! A Viet Cong claymore mine or a satchel charge exploded followed by automatic rifle and machine gun fire coming directly at us. As I was hitting the ground I saw several of our soldiers from getting hit by enemy bullets. The shattering noise would barely describe the heavy volume of enemy fire and the stinking smell of gun powder filled the air as we fired back at a tree line filled with enemy fighters. Surprise and confusion was soon replaced by anger and fear as a real slugfest developed. After the initial burst of fire our troops, lying in the prone position all over that rice paddy, tried to be as small as possible while enemy mortar rounds began dropping in on us. Screams for medic could be heard everywhere and I vividly recall one brave medic who never got lower than a crouch going from one wounded soldier to the next and never receiving so much as scratch. He stood out like a lone cue ball on a pool table, but he did his job without hesitation. Pretty soon, our artillery and jet air strikes began to take control of the situation but that battle cost Alpha and Charlie Companies 7 KIA's and a number of WIA's along with a pile of dead Viet Cong fighters. July 11th proved to be quite an introduction to combat duty in the Mekong Delta wouldn't you say?